3D reconstruction in progress ..
... the full scale model of the Soviet lunar rover Lunokhod 1, the first robotic vehicle ever to roll on the surface of another celestial body in 1970-1971, fallen into neglect in a container at the backyard of some russian space institute, spotted and photographed by a visitor in 2010. 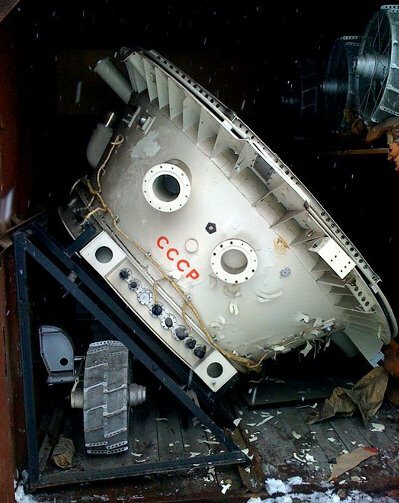 [ :: Of course for the sake of the complete story it must be added that the Russian Institute for Space Research was quick to point out that this and other models were handed it in that desolate state and that the models were just about to be lovingly restored by the institute. 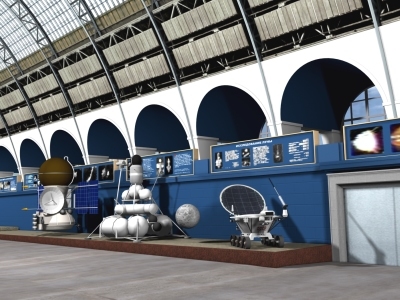 Anyway, browsing the web I stumbled by chance upon this image about two years ago, and it brought back nostalgic memories of a visit to the USSR way back in the 1980s when I had visited the Cosmos Pavillon at the Exhibition of Economic Achievements (VDNKh) in Moscow, a huge exhibition full of similar live-size replica models of historic soviet spacecraft. I wondered what had become of the place and searched the web. 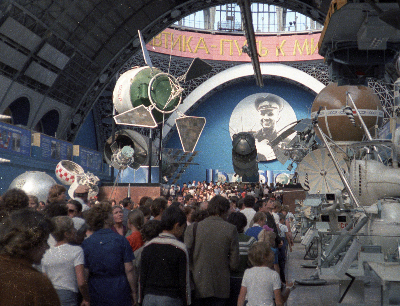 It was sad to learn that the Cosmos Pavillon as a space exhibition didn't make it through the early 1990s. 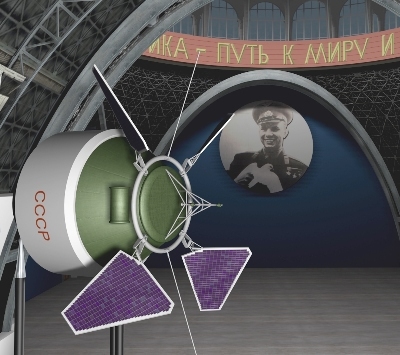 Only some of the exhibits were relocated to the nearby Memorial Museum of Cosmonautics and the building was used for multiple purposes since, a.o. a car dealer shop, a garden shopping mall, agricultural or sports exhibition venue. 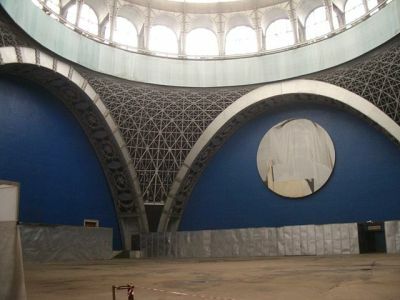 For many years the image of Yuri Gagarin overlooking the scenery was still in its place but covered with a cloth .. a sad sight again. My name is Jens Mondry, I'm a physicist and work in the fields of spectral analysis, color and thin film measurement. As a sideline interest I do 3D modelling and animation for medical visualisation. In-between my medical 3D projects, however, I try to stay up-to-date with my tools and skills in 3D modelling. This is best done by doing real 3D projects with a purpose .. and so the whole idea took shape. Since my childhood I have been a spaceflight and science fiction enthusiast. So with the 3D tools at my disposal the natural thought was "Why not try to re-create the experience and the nostalgic space-age charm of this special place(s) in a 3D reconstruction?" A few months ago I started putting things together in earnest. I started to outline the buildings of both Lost Exhibitions, and of course started to modell some of the exhibits. The results of the modelling are displayed on these webpages. The project of course is in a very early stage, being carried forward mainly in the spare time I have or during holidays. So progress is somewhat sporadic. In the course of this first modelling practises I soon realised that you need a LOT of pictures, especially high res pictures, taken at the exhibition, to create convincing models of the exhibits and the place itself. Therefore I'm asking visitors to support this project by sharing their pictures of the lost exhibitions. The ultimate goal, however, would be to allow people to freely walk through these Lost Exhibitions in virtual space and explore the atmosphere and the exhibits at their leisure. I do not want to create and maintain separate low-poly, low texture versions of the 3D worlds for the sake of walkthrough, so I'm occasionally monitoring current technologies for stand-alone or online visualisation straight from the 3dsmax scenes as they are. I might give some of these technologies a trial shot in the nearer future (and put the results online), but at the moment I feel the compromises of quality vs. perfomance are still too demanding to get the atmosphere and the educational content across. I'm optimistic that within a few years communication bandwidth and software technology will allow for a higher quality scenario. Until then I will continue to try to complete and expand the virtual exhibitions and do nice renderings ... we'll see.